Retro seems to be making a comeback. The Telegraph reports that things that are obsolete like vinyl records, VHS tapes, and black-and-white photography are all finding places in the modern world. It seems, however, that nothing is being revived quite as fast as retro fashion is. Browse Nail Polish and Nail Art Products on Amazon Now! It all started with Zooey Deschanel and the “1960s haircut” that she’s become quite known for (she recently brushed her bangs off her face, and nobody could even recognize her). She sparked a retro fashion craze that’s still being seen in various Lookbooks and Pinterest boards. If you’re not up for wearing a 1960s haircut, false eyelashes, and mismatched patterns, you can look into one of the world’s oldest games for some inspiration. Bingo saw a huge boom in popularity in the 50s and 60s, and it has endured until today. One might even say that bingo is more popular now than ever before, thanks to the internet and television, the game has been able to catch the public’s eye. Last year, in an effort to promote the company’s new line of nail wraps, FoxyBingo on Twitter announced that it would be bringing the Mani-cam to the Allstarz Summer Party. Bingo operators are also airing TV and radio ads, drawing millions of players to their online sites. The game itself, however, has remained largely unchanged. It’s still the game of numbers that many of us will remember, and it’s quite easy to take inspiration from the patterns predominantly found in the game. Circles and grids are a great way to go here, and while this pattern is great for beginners, it also offers a great deal of customization for experienced nail artists. Pick a neutral base color and put on the base coat. 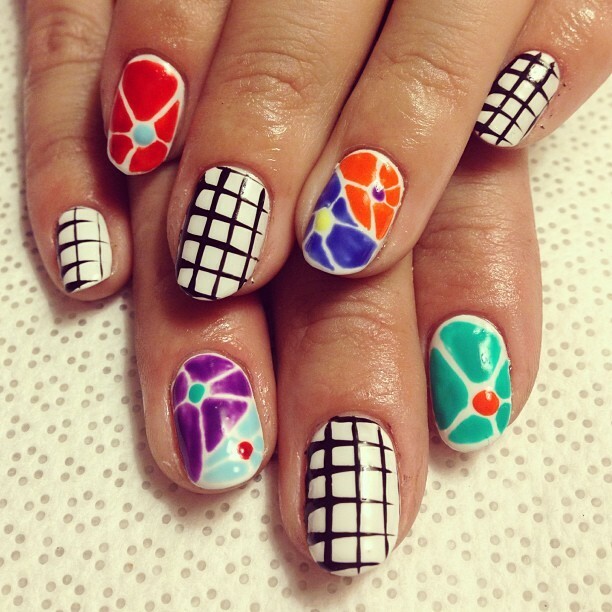 You can then proceed to use your nail art pens to dot some of your nails, and create little grid patterns on the others.